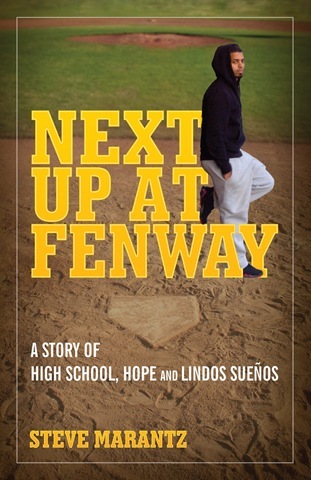 Next Up at Fenway tells the true story of Marcos Baez, whose public high school next to Fenway Park was his best hope for a college education and a better life. Baez, the son of a Puerto Rican mother and absent Dominican father, personifies the struggle and determination of America’s fastest-growing demographic. One of two Boston high schools recognized as a school “where Latinos succeed” by the Mauricio Gaston Institute of the University of Massachusetts-Boston, Fenway High’s unique programs highlight family culture, critical thinking, and community involvement. Through its innovative curriculum and Latino-sensitive culture, the school helps Latino students succeed academically and in personal development. Inspired by this educational model, his teachers, and the Red Sox Foundation’s Lindos Suenos program that sent him to the Dominican Republic for training and community service, Baez works toward his goal of college. Author and journalist Steve Marantz spent two years in the classrooms and hallways of Fenway High, alongside Baez, his classmates, and teachers. With unlimited access, Marantz has chronicled the Latino soul of one of America’s most amazing and unusual schools. A story of culture and empowerment, Next Up at Fenway explores what one youth can accomplish against all odds to become an inspiration to his community and Latino youth everywhere. Steve Marantz is a researcher/producer for the ESPN E:60 show and a former reporter in government, politics and sports for the Boston Globe and Boston Herald. His last book, The Rhythm Boys of Omaha Central: High School Basketball at the ’68 Racial Divide, won the ForeWord Reviews gold medal for non-fiction sports and the Nebraska Center for the Book award for non-fiction history. He also authored Sorcery at Caesars: Sugar Ray’s Marvellous Fight. Marantz lives in Swampscott, Mass., with his wife, Alison Arnett, and their dog, Arthur.